1920-24: (Emile & Henry A) Berliner Aircraft Co, College Park MD. 1929: Berliner-(Temple Nash) Joyce Aircraft Co, Alexandria VA; 1929: Baltimore MD. 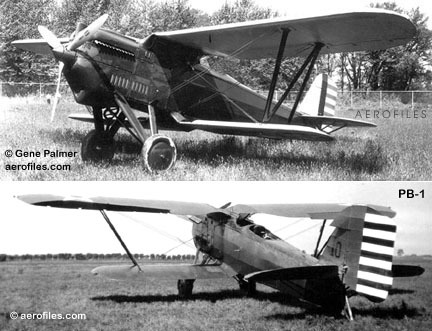 1930: Merged with General Aviation Corp, which became North American Aviation; Joyce to Bellanca Co, Berliner to ERCO. 1933: Company dissolved by NAA. Despite his pioneering work in aviation, German immigrant Emile Berliner is more popularly known as the inventor and patentholder of parquet flooring (1883), the Gramophone (1888), the flat phonograph record (1895), the microphone (c.1900), the world's first lightweight internal combustion engine (his Gyro rotary), and acoustic tile (1926), as well as many lesser creations. He also discovered and patented "Nipper," the music-appreciating dog that ended up as RCA Victor's famous trademark. It's logical to say that, like Bell and Edison, Berliner's genius has touched most everyone on the planet. Basic Trainer c.1930 = Enigmatic prototype for Berliner-Joyce OJ, bearing the equally enigmatic tail number of , which also belonged to a Fairchild FC-2. Little data were found on this one, and the choice of model name, "Basic Trainer," was ours, having no factory number or logical category under which to place it. 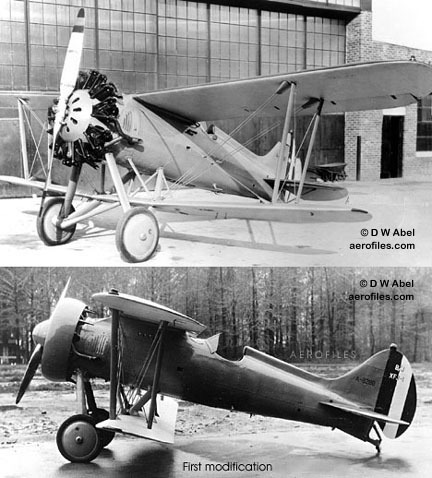 CM-3 1928 = OhwM; 100hp Curtiss OXX-2. POP: 1, likely the prototype for CM-4 . CM-4 1928 (39) = 3pOhwM; 90hp Curtiss OX-5; span: 36'0" length: 25'10" load: 810# v: 105/90/41 range: 470. Henry Berliner. First parasol wing to earn an ATC. $3,290; POP: 6 [C75E, C204E, C269E, C4660, C4993]. Became Berliner-Joyce CM-4. CM-4B 1929 = 110hp Warner Scarab POP: 1 [C441]. CM-5W 1928 = CM-4 with 220hp Wright J-5; length: 25'8" load: 1025# v: 136/110/45 range: 550. POP: 1 . CM-6 Dragon 1928 = CM-5 with 110hp Warner Scarab. $5,850; POP: 1. D c.1920 = 1pOH. Early single-rotor helicopter with concentric blades proved unstable. Other designs succeeded this first experiment. E 1929 = 2pChwM; 65hp LeBlond. POP: 1 [X/N618E] c/n 1. Designation is puzzling, since its registry has it as the Berliner-Joyce 29-1, according to Historical Aviation Album, but 1930 Aircraft Yearbook lists it as B-J "Commercial." Flying Boat 1931 = 1pOhwM; outboard marine engine mounted amidships, driving a top-mounted propeller via a chain. Twin-boom rear fuselage. Registered  in 1931 by Engineering & Research Corp and designated C-M-9. It appears to have been built by Henry Berliner between when he left Berliner-Joyce and started ERCO. Helicoplane 1924-25 = STOL biplane, "helicoplane" succeeded a Berliner triplane of 1922. Henry Berliner. It had the same 200hp Bentley rotary and similar lift propellers as the triplane. Rotor: 20'0"; gross wt: 1850#. Helicopters 1907-24 = Various 1pOH. Emile Berliner. 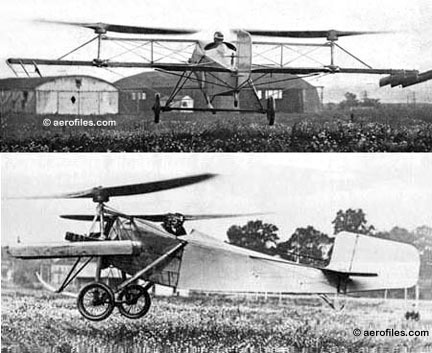 Early experiments with helicopters began with Berliner's first machines, a 1907 single-blade model with his own design 36hp rotary (built by Adams Co, Dubuque IA) driving a 17' rotor at 150rpm, and a 55hp Adams-Farwell twin-blade version with rotors on either side of cockpit. (It was noted in 1909 Jane's that a parachute was carried "for emergencies.") Although both had marginal flight characteristics, they were historic events as the first time a rotary engine flew (but it took the French to popularize them). In 1913, a basic framework design based on the Williams Helicopter, dubbed "gyrocopter," did gain brief, tethered flight, but those who credit this as the world's first man-carrying helicopter overlook Cornu and Bréguet's flights in France many years earlier. Berliner's first helicopter recognizable as sucha wheeled platform with two rotors above the pilot's seatmade its first flight a few feet high on 6/10/20 (p: son Henry Berliner), and managed to travel forward for a measurable distance. Continuing experiments produced the first helicopter to achieve controlled horizontal flighta war-surplus Nieuport biplane fighter with tilting tail rotor, and a short-span upper wing with 14'0" helicopter blades at the tips. In a demonstration for the military, on 7/16/22, at College Park MD, it rose to 12' and made a few short-distance flights (p: Henry Berliner). On 2/23/23, a triplane version (220hp Bentley rotary; span: 38'0" length: 20'6" rotors: 15'0") flew at an altitude of 15' for a little more than a minute and a half. -Joyce 29-1, "All-Vision" (aka Commercial) 1929 = Shoulder-wing final copy of the civil Berliners. 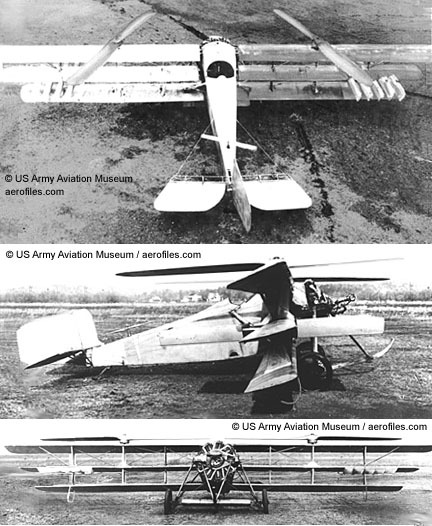 2pChwM; various 65-100hp LeBlond, Kinner, and Cirrus engines; span: 38'1" length: 26'3". Tandem seats. POP: 2 [X247M, X618E]. All-Vision was rebuild of the 29-1 with raised cabin roof for better visibility, possibly with 220hp Wright J-5. -Joyce CM-4 1929 (ATC 39) = Same as Berliner CM-4. POP: at least 2 [NC484E, NC619E]. 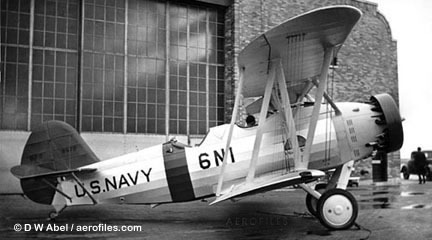 -Joyce F2J 1934 = USN. 2pO-CB; 625hp Wright XR-1510; span: 36'0" length: 28'10" v: 193 ceiling: 23,800'. POP: 1 as XF2J-1 [A8973]. -Joyce F3J 1935 = USN. 1pOB; 625hp Wright R-1510-26; span: 29'0" length: 22'11" v: 209 ceiling: 24,500'. POP: 1 as XF3J-1 . -Joyce FJ - USN. 1pOB; 450hp P&W R-1340C; span: 28'0" length: 20'7" load: 741# v: 172/x/65 range: 400. Unusual but attractive design with underslung lower wing, gull upper wing. XFJ-1 1930 = POP: 1, damaged during testing [A8288]; ff: 5/x/30. 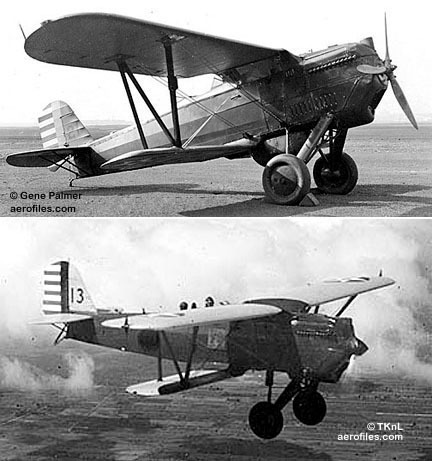 XFJ-2 1931 = Rebuilt XFJ-1 with cowled 500hp P&W R-1340-92; v: 193/x/64 range: 520 ceiling 24,700'; ff: 5/22/31. Underslung lower wing. Sleeked up with large wheel pants to catch USN testers eyes, but proved unstable in flight tests and was rejected. $44,000; POP: 1 [A8288]. -Joyce OJ - USN. 2pOB; 400hp P&W R-985A; span: 33'8" length: 25'8" v: 151 ceiling: 17,400'. 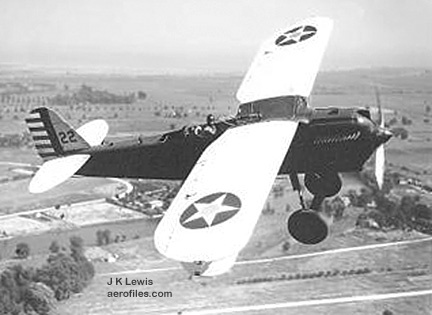 XOJ-1 1931 = $35,000; POP: 1 with full-span Zap flaps on both wings [A8359]. OJ-2 1933 = Production model; POP: 38 [9187/9204, 9403/9411, 9572/9583]. XOJ-3 1934 = 2pCBF with single .30 gun in top wing. POP: 1 converted from and back to OJ-2 [A9196]. -Joyce P-16, PB-1 - USAAC. 1pOB; 600hp Curtiss V-1570; span: 34'0" length: 28'2" v: 175/151/x range: 650 ceiling: 21,600'. Gull top wing. XP-16 1930 = Supercharged V-1570-25, two-blade prop. POP: 1 prototype [29-326]. Scrapped 5/24/32. Y1P-16, P-16, PB-1 1931 = Non-supercharged, three-blade prop. 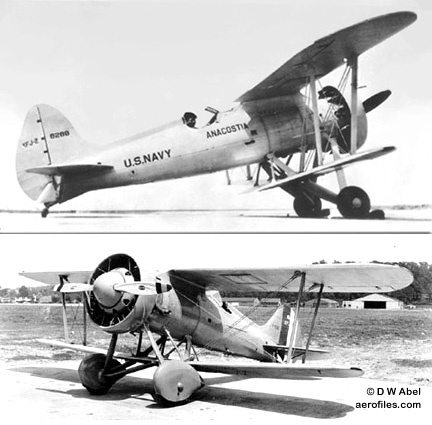 POP: 25 [31-502/515, -597, 32-221/230], redesignated PB-1 as first entry in the "Pursuit Bi-place" category, which was assigned only twice before someone realized there was much confusion between "biplace" and "biplane"Consolidated had the PB-2.